Last night we met a local in the next-door restaurant who told us that he’d been on one of the turtle tours where they take you to watch sea turtles coming to the beach to lay their eggs. Unfortunately when he did they sat around until 11 pm playing dominoes without a turtle in sight. That was a few years ago, and he said that this year they’ve been coming back in significantly greater numbers, which is good for the turtles, but at $40 per person plus the cost of a hotel close enough that we wouldn’t have to ride the bikes to the pick-up and then deal with hiking the beach in gear… we debated the value of the attempt. Decided we’d rather just save the money and go directly to the Arenal Volcano. And we did, after a return trip to the local restaurant where we discovered that the young woman who’d been serving us the other night wasn’t just a surfer girl down from Seattle for a while. No, she was the owner, along with her equally young husband / cook. They’re in the process of changing the name of the restaurant, so I can’t tell you what it’s called, but it’s just before the Hotel Tamarindo Inn (easy to spot sign) as you’re coming into town from the east. She says they’re famous for their cubans (sandwiches not cigars) and they have something called a No Name which is definitely worth a taste. While we were waiting for breakfast I noticed that there was a good shot available of my bent kickstand foot for you to see what I’m talking about. Almost every place we stop i gouge a small pit in the ground. Plus, I frequently have to tip the bike far to the right to get it out. The plan is to find a welder, remove this, and have him weld on a piece of steel to replace it, after first welding the big hole in Dachary’s pannier. 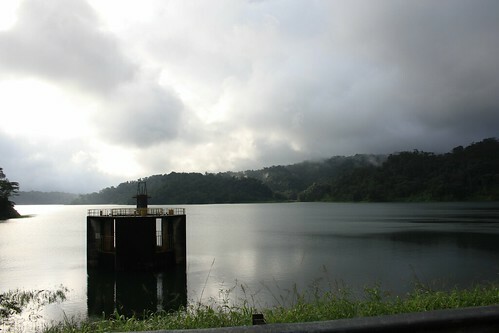 We made our way forward until we found a great view of the western end of Lago Arenal which was beautiful, but somewhat covered in clouds. We had set out with blue skies and high temps. 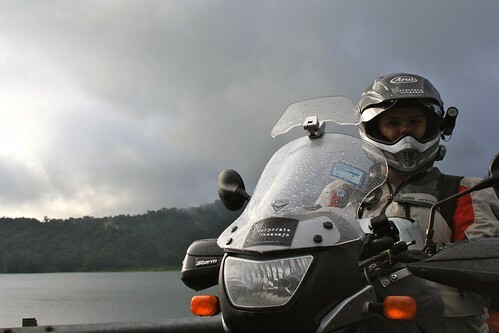 What we failed to grasp was that we’d ridden to the edge of a rain forest, and as we made our way closer to Arenal it turned from mist, to rain. Neither of us bothered with our rain liners because we were so warm, so we got rather drenched. It wasn’t really a bother though. We were drenched with sweat from earlier in the day, so we we figured it would be somewhat cleansing for our gear if nothing else. We never saw Arenal volcano. The GPS claimed it was just off to the right. A bicycle tour guide (and ex motorcyclist) we ended up speaking with said “it’s right there” and pointed to a cloud. The driving though…. absolutely incredible. 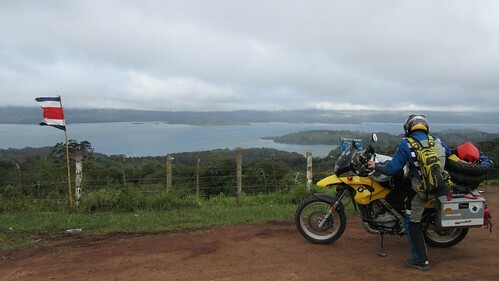 We loved the ride around the northern side of Lago Arenal. It was beautiful lush vegetation, with intermittent glimpses of incredible cloud covered lake, which we would have taken pictures of for you except it was raining, there was nowhere to pull over, and the few places that looked wide enough to get off the road on had deep wheel ruts in the mud. This is definitely a must-ride motorcycle road, though, if you’re ever in the area. 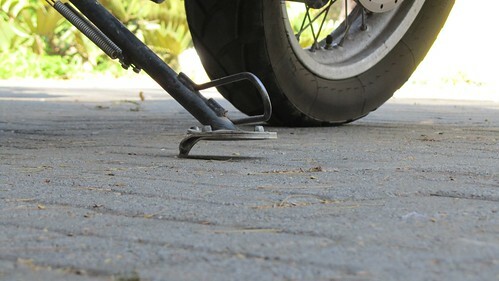 There are areas of the roads that are just swamped with potholes, and some of them are quite deep, but as a motorcycle, you have no problem getting around them. Slalom, slalom, lean, lean – and you’re through, while the cars and 4x4s are still swerving around crazily to avoid them. Don’t do it at night, though, because there are many sections where the lake-side lane is simply missing, or has simply fallen away, and instead of repairing it, they tell you to cede the right of way and deal with it being a one-lane stretch. We drove on to La Fortuna which was renamed after the initial explosion of Arenal because they were the fortunate ones on the side that didn’t blow up whereas the two towns on the far side were wiped out. We stopped at one hotel, then pulled over near the central park and I started to wander around looking for alternatives (it’s a *very* small town). I checked another hotel on our list and then saw Hotel El Volcan just down the street. It had Wi-Fi, AC, and let us stick our bikes just in front of the office door and was only $35 which is an awesome price in this tourist town. The room is cheap but clean… except for a single ginormous cockroach we discovered in a corner being hog-tied by a spider. I left the spider to its business. But, it has actual, honest to goodness hot water. We ignore all claims about “hot water” these days and were amazed to find it actually had water hot enough to require the addition of cold. It was luxurious. After we showered off the disgusting layers of sweat we went into town, had a somewhat crappy dinner, and checked the prices at the many places offering tours of the volcano. The thing about the volcano is, when you read about Arenal, there are mentions of “on a clear day” and “when the clouds break” but what you don’t realize is just how thick and pervasive the cloud cover is. We’d ridden right past the volcano and not seen it, so we made sure to find a tour that spent time going through the nearby forest and talking about the wildlife as we were unlikely to actually see the volcano even on a tour. We ended up going with the most expensive ($45 US each) one because they seemed to offer the best combination of things. We had to choose this night because we’d heard tale that the best time to go was first thing in the morning, both because of the likelihood of seeing fauna, and of seeing the volcano. WE’VE BEEN BLOGGED!! AHH soo cool! Thanks so much for stopping by. The pictures from your trip are amazing so far, glad we made the cut! Thanks, hope to see you again some day. We made it back to Seattle, greeted by our obligatory cold and rain which has accelerated plans for another trip to Costa Rica! 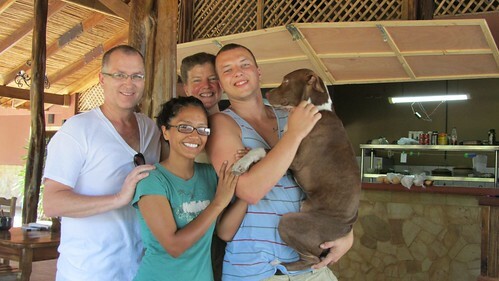 Hi Ian and Addy and Ruth and Mike! Glad you all made it by to the blog, and it was a pleasure meeting all of you! Ian and Addy: we’re rooting for your business. The food was awesome and we’ve been telling all the travelers we meet in Costa Rica about it in case they get out to Playa Tamarindo.